Pabst Brewing Company did well at this year's GABF competition. Old Style won a Silver in the "American-Style Specialty Lager or Cream Ale or Lager" category. 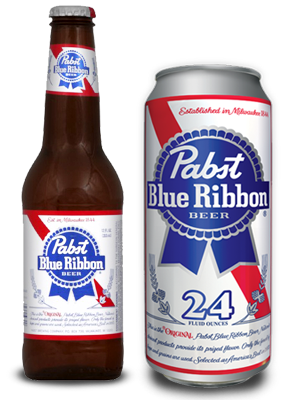 Pabst Blue Ribbon won a Gold in American-Style Lager, Light Lager or Premium Lager category. A gold and a silver in this competition is a fantastic accomplishment. I have not tasted either of these beers in a long time, but I considered both of them cheap crappy beer back in college when all I drank were cheap crappy beers. Since college, I have made fun of people who drink PBR and Old Style. Now, I feel bad about that. If I have ridiculed you for enjoying PBR and/or Old Style, I sincerely apologize. I doubt that my father-in-law reads this blog, so that apology probably doesn't mean much. Next time I see him, I'll be sure to say I'm sorry. To be honest, my pallet is not sophisticated enough to pick out a medal-winning example of either of these two categories. To me, these types of beers all taste more-or-less the same, and I don't really like them. Just because I don't like these beers, doesn't mean they are bad, though. Remember, I didn't care for Dogfish Head 120 Minute IPA, which any beer-geek (or at least most of them) will tell you is a wonderful beer. Did I just compare PBR to DFH 120 minute? That doesn't happen every day. If you can find another blog post or web page that mention both Pabst and 120 minute, please leave the url in the comment section below. Anyway, congratulations to Pabst Brewing Company, and if you are out at a bar in the near future, go ahead and order one of their beers for yourself. Tell the bartender to put it on my tab and let me know how it is. I'll be sure to let you know if I have one. I confess. i was one of those guys who made fun of PBR drinkers. I have a local beer bar that serves both PBR and 120. Different strokes for different folks I guess. Well, hopefully, like me, you see the error of your ways. Of course, I cannot guarantee that I will stop making fun of PBR drinkers. They are just too easy a target. I wonder if there is anyone at your bar who has had drinks both the 120 and the PBR on the same night. If you drink the 120 first, you probably do not even taste the PBR. Novelty Beers ... Oct 2012 "Session"